It’s hard sometimes to find engaging board games when you have an only child, like I do. Many of the board games my son and I like best are made for 4 players, so if we don’t have friends over we’re sunk – there’s only so many games of Go Fish or Battleship you can play. That said, we play a lot of Mancala. Not only is Mancala a great game for teaching counting, strategy and patience, but also it’s fun, yet calm and perfect for just two players. Also, a bonus, Mancala isn’t flashy or loud, just good old fashioned kid-powered fun. My son and I highly suggest this game, but sadly our Mancala board is nowhere near as awesome as this one. 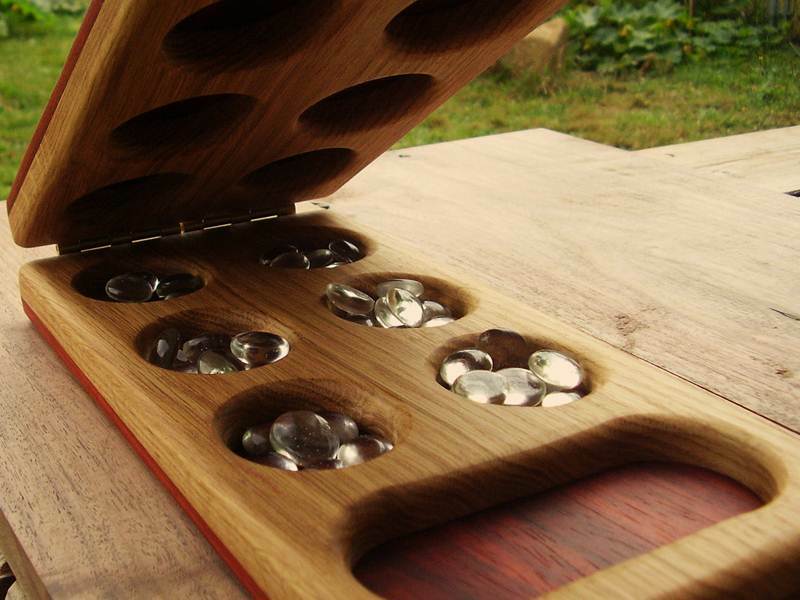 This beautiful set is the first eco-friendly, and maybe the best Mancala game I’ve seen, handmade by a small family business, Heartwood Natural Toys. The set is made with gorgeous solid wood, non-toxic glue and a simple finish of linseed oil. The nuggets included are clear and pretty glass. If you want to give Mancala a whirl, note that it’s best for kids aged four or five or older. If you’ve never played, here’s a Mancala primer. Love Mancala!! Its such a great game to teach the kids! It's hard sometimes to find engaging board games when you have an only child, like I do. Many of the board games my son and I like best are made for 4 players, so if we don't have friends over we're sunk - there's only so many games of Go Fish or Battleship you can play. That said, we play a lot of Mancala. Not only is Mancala a great game for teaching counting, strategy and patience, but also it's fun, yet calm and perfect for just two players. Also, a bonus, Mancala isn't flashy or loud, just good old fashioned kid-powered fun. My son and I highly suggest this game, but sadly our Mancala board is nowhere near as awesome as this one. This beautiful set is the first eco-friendly, and maybe the best Mancala game I've seen, handmade by a small family business, Heartwood Natural Toys. The set is made with gorgeous solid wood, non-toxic glue and a simple finish of linseed oil. The nuggets included are clear and pretty glass. If you want to give Mancala a whirl, note that it's best for kids aged four or five or older. If you've never played, here's a Mancala primer.